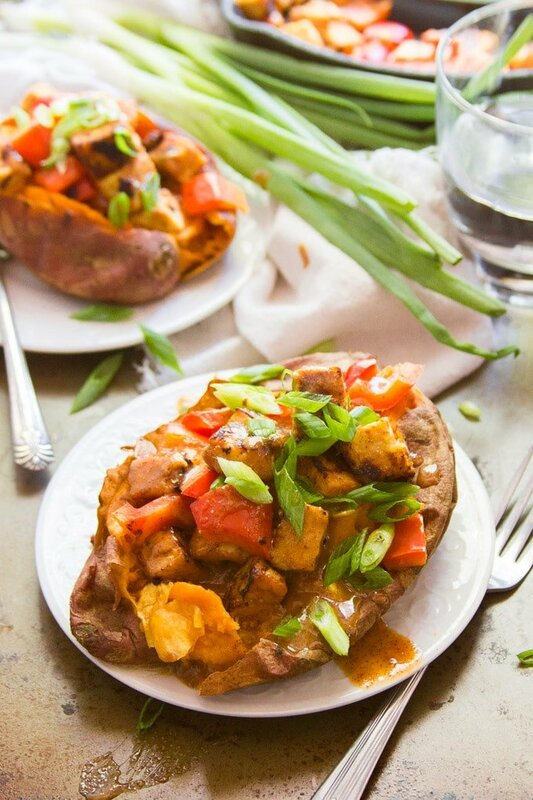 Juicy baked sweet potatoes are stuffed with an Asian-inspired gingery tempeh stir-fry and smothered in luscious almond butter sauce to make this vegan meal that’s both scrumptious and super easy to whip up! Can we take a break from all the Thanksgiving recipes for a moment? 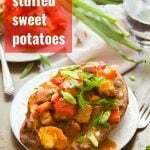 Today I’ve got some sweet potatoes for you all, but Thanksgiving sweet potatoes these are not. In fact, I won’t be sharing any Thanksgiving sweet potato recipes this year because after multiple failed attempts at what I thought would be the best sweet potato side dish ever, I gave up. I promise I’ll be back soon with yet another holiday dish, but in the meantime, I’m sharing this because I’m guessing you all need something for dinner on normal days, right? Thought so! This is actually an old favorite from the early days of this blog. I loved this recipe so much! But it didn’t get a ton of attention. I’m hoping the recipe gets a little more love this time around. This one is also really easy, which makes it great for this time of year when we’re all probably getting a little sick of cooking. 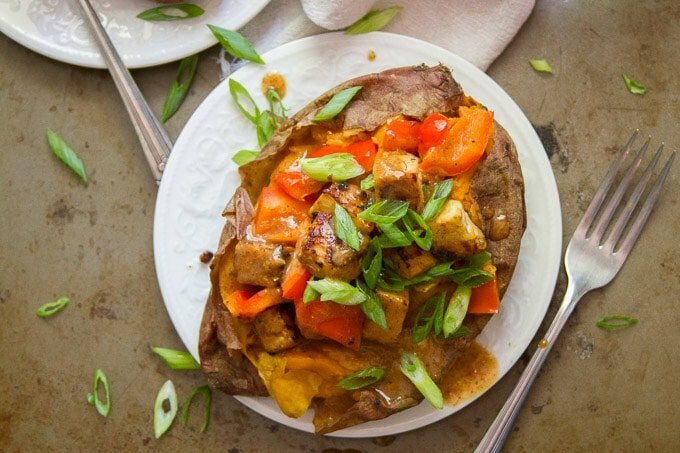 Here’s how it works: bake up some sweet potatoes, and while they bake, stir together a simple sauce and cook up a simple stir-fry that gets stuffed into those sweet potatoes. Starty by mixing up some seasonings. 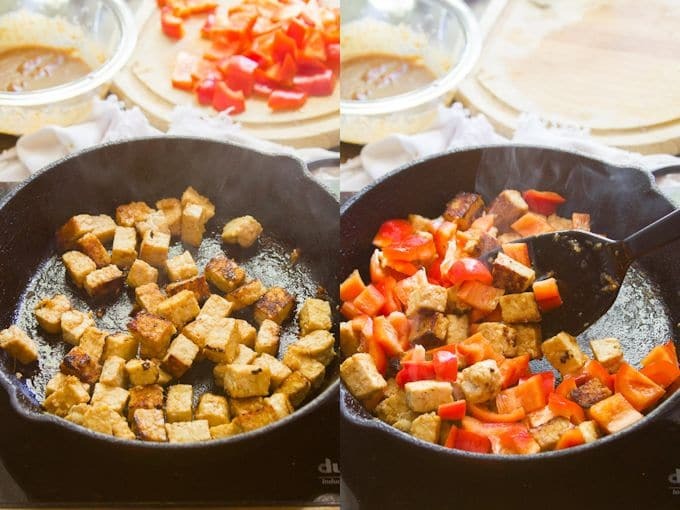 Brown the tempeh in a skillet for a few minutes, then add the seasonings and diced bell pepper. Stir-fry for a couple of minutes, and it’s done! When the potatoes are done, stuff them with the tempeh mixture, drizzle with almond butter sauce, and sprinkle with scallions. Devour. I really prefer my sweet potatoes baked, but feel free to microwave them if you need to save time. Switch things up by making this with peanut sauce instead of almond butter sauce. Just swap out the almond butter in the recipe with peanut butter! Feel free also to switch up the veggies. I really like the sweetness of red bell pepper in this, but just about any stir-fryable veggie will work. To keep this recipe gluten-free, substitute gluten-free tamari for the soy sauce. Juicy baked sweet potatoes are stuffed with an Asian-inspired gingery tempeh stir-fry and smothered in luscious almond butter sauce to make this vegan meal that's both scrumptious and super easy to whip up! Poke a few holes in each sweet potato with a knife. Place the potatoes on the oven rack and bake until they're easily pierced with a fork, 40-60 minutes, depending on size. Taste-test and adjust any seasonings to your liking. Thin with water as needed. When your sweet potatoes have about 10 minutes left to bake, stir the ginger, garlic, lime juice and soy sauce together in a medium bowl. Add the tempeh cubes and toss to coat. Add the tempeh and cook for about 10 minutes, flipping once or twice to get browning on multiple sides. Raise the heat to high and stir in the bell pepper. Stir-fry the mixture for about 2 minutes, until the peppers are tender-crisp. Cut each sweet potato open lengthwise and stuff with tempeh mixture. Top with almond butter sauce, scallions and sriracha. Serve. This looks DIVINE!! I’ve added it to my Pinterest list! Thanks Linday! I hope you enjoy it! It’s almost lunchtime and I’m seriously wishing I could have this, ha ha! I’ve only made tempeh once; I don’t think I cooked it properly, because it gave me a stomachache afterward. :P This recipe definitely makes me want to give it another try! This looks just amazing. 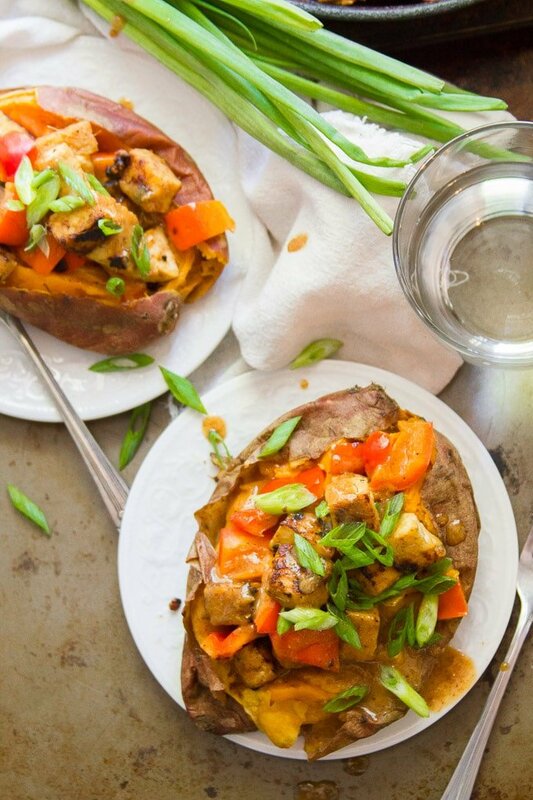 I love baked sweet potato… I usually have it with (almond/cashew) cream cheese. So good. I literally have been dreaming of this…. you have no idea. I went to the store to get some almond butter and sweet potatoes :) I think I will be making this with tofu or chickpeas… havent decided yet. I have never tried tempeh.. but I think its a little on the expensive side. Awesome! Thank you so much Claudia! I really loved this one and I still dream about it occasionally myself. :) Tofu or chickpeas both sound like good subs for the tempeh. I was actually thinking of trying it with chickpeas myself next time. Hope you enjoy them! This is THE most delicious meal I’ve ever eaten. Seriously. My husband and I couldn’t stop talking about it for days!! We’re going to try the tempeh and almond butter sauce on noodles, rice – anything! But it is especially delicious on baked sweet potatos! Yes! This was one of my all-time favorites, so I’ve been hoping to hear from somebody who made it. I’m glad you gave it a try and enjoyed it as much as I did!!! Thank you!! Made this for dinner tonight, and it was delicious. Very filling, too, which is great on a cold winter day. Thanks for the wonderful recipe. This was incredibly easy and so, so delicious! The sauce is amazing and I will be making even more next time to use on other dishes! I made this for dinner tonight for my turn to cook. We don’t cook a lot, and are trying to more often. 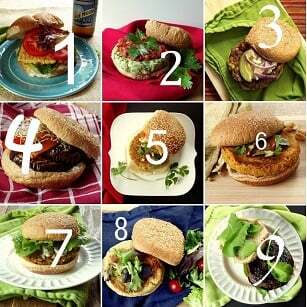 It is so incredibly EASY and DELICIOUS! This will go on the permanent list of things we can make with no problem. Thanks! Yay! This is one of my favorites. I’m happy to hear it’s become one of yours too! WOW! So delicious! I used peanut butter and a little bit of water instead of almond butter and it tasted so good! At first I was worried there wouldn’t be enough sauce, but it was the perfect amount. Thank you so much for this recipe! I will be making this again and again! That sounds delicious!! I’m so glad you enjoyed it! This has been one of my favorite go-to recipes for years, I absolutely love how tasty and healthy this dish is. I make it with pure maple rather than agave, but everything else exactly as written. Thanks for the recipe! Super late to this potato party but just made it last night for the first time with Trader Joe’s 3 grain tempeh and used maple syrup instead of agave too. Flavors are amazing, will definitely become a staple for me!